for-e-ver. Seriously, years. I had extra incentive to read it now because I put it on my Fall TBR list, AND my face-to-face book club chose it for November! Amy Tan's reputation precedes her, of course, so I was really excited to pick this one up. The novel is about three mothers (and a fourth, deceased) and their four daughters. It's split into four sections with four short stories or vignettes within each section. A grand total of 16 vignettes, if you're not crazy about the math. I wasn't expecting this format (duh!) even though my first introduction to this book was seeing the chapter, "Two Kinds" anthologized and taught in high school and university courses. As a lover of short stories, or short story cycles (stories tied together, vignettes that make a whole) it didn't bother me in the slightest. And on the whole, I've heard sooo many people say they love this one, it makes me hopeful that this format can be appreciated by more people, rather than less. Fingers crossed! I did have trouble keeping the mothers and daughters in this book straight at times. However, I found that there were enough details within each vignette that I had a solid overall feeling for the family plight and how each mother and daughter related to one another. The overarching themes deal with the ways in which mothers and daughters relate to each other or fail to relate to each other. They constantly lose each other and float back together. The cultural differences between Chinese mothers and daughters raised in America are extremely prevalent, and I found that aspect of the book affecting and extremely powerful. There are enough barriers between mothers and daughters without the addition of language and cultural differences. That worked as a beautiful analogy. The Joy Luck Club is also a heartbreaker in spots. These women fight their way out of war torn countries, abandon children out of necessity, endure crappy families. Death is no stranger to this group. My favorite "thread" within The Joy Luck Club was the story of Suyuan Woo and her daughter Jing-mei or June Woo. Suyuan actually passes away before the book's start so while most of the mothers and daughters get two chapters each, June is the center of all four of her chapters. June is invited to Suyuan's mah-jong group. It's through her mother's closest friends, her memories, and her experiences visiting China that she comes to know her mother better--even though she's already passed away. I'm doing a really sucky job of explaining why I loved this book, but it's beautifully written, it's accessible no matter what your cultural background, and it's universal to those difficult (at times) mother/daughter relationships. I also thought this one might be a bit dated, but it transcends the 80s and early 90s, when it was originally published. I have more Amy Tan on my shelves...Saving Fish From Drowning and The Kitchen God's Wife. I'm even more excited to read them now, and I'm extremely glad that I put this book on my Fall TBR, and a big THANK YOU to my book club for rolling with it! Have you read any of Amy Tan's work? What did you think? 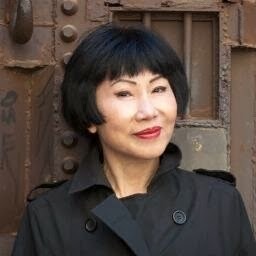 You can also follow Amy Tan, and tell her how awesome she is, on Twitter! Source: Bought it forever ago! I've never read any Amy Tan, though now that you mention it I'm fairly sure I've read at least one of the sections from this in an English class before. For whatever reason, I hadn't been interested, but you've definitely made me want to pick this one up! I bet you read "Two Kinds!" I hope you like it if you pick it up. Lots and lots of connections to make. I'm the same and I've had this book on my Amazon wishlist for a long time thinking it was really something I should read. I really should get around to doing that! I seriously need to read this… even have it on my Classics Club list. The Kitchen God's Wife was my fist Tan novel and is still my favorite. After reading several others, they all started to blend together. It's been a few years now, so I'm ready for The Joy Luck Club. LOL, maybe! I had it on my Classics Club list, too. I knew I wanted to read it this year because it's been staring at me and mocking me. I hope you like Joy Luck when you get to it! It's been YEARS since I read this so I don't remember the particulars of the book but I do remember loving it. It sounds like a reread should happen. Absolutely! I think it's one of those books I'll re-read at some point. I was lucky enough to get my copy of The Joy Luck Club autographed by Amy Tan back when I was in college and she visited my college. But it was the Kitchen God's Wife that I remember blowing me away at the time. I really should re-read both sometime. THAT IS SO COOL! I am even more excited to read The Kitchen God's Wife now, too! 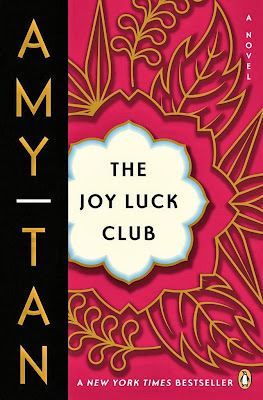 The Joy Luck Club is one of my all-time favorite books because I can connect with it so much. It transcends time since I still find so many of the things that were written in the book relevant today. While the movie wasn't as good as the book, I do recommend watching it. Amy Tan co-wrote the screenplay (I think?) so it does a pretty good job portraying the book. I'm working on The Valley of Amazement, which is Tan's latest book, and it's pretty good as well. Amen to that! I found it very relevant despite the passage of time. The themes are so universal, I don't think it'll ever go out of style. I will definitely try the movie, at least. Whew! Thank goodness you loved this book. I was waiting with anticipation because I loved it so much. And I agree - it's hard to pinpoint WHY it's such a great book, but yet there you have it! Haha! It was wonderful. Seriously awesome. Home run! DUDE! I haven't read this one and I don't know WHYYYY because I LOVED The Kitchen God's Wife, Saving Fish From Drowning, and The Bonesetter's Daughter. Duuudette! You've read all the ones I still wanna read!! This will be right up your alley. "They constantly lose each other and float back together." Beautifully stated! I've read The Joy Luck Club twice and cried both times at various moments. I love this book because it truly captures the mother/daughter bond. A very touching book that I likely will read again! Right?? I got a little teary myself. And this is one of those books I wish I'd read as a younger person. I think my reaction might've been slightly different between my younger days and after motherhood. I should reread Amy Tan! I don't think I've read anything of hers since high school, which is weird because I quite liked The Joy Luck Club and the other book of hers that I read and now I can't remember what it was called. I should give her new one a try. The writing in Joy Luck Club really is awfully good. It takes a lot to make me enjoy a book of interlocking vignettes, and I did this one. Definitely! The new book sounds amazing. I listened to her interviewed about it this morning. I'm glad you liked this one so much. It sounds like a memorable read for ya. Thank you! I'm glad to know you've read widely within Tan's work. I'm looking forward to more. I liked this one, but I didn't love it. I'm not sure why i didn't get hooked. Maybe, like you, I got kind of confused with who was who. . . or why the story was important as a whole. . . it just missed the "amazing" mark for me. I think it's one I'll appreciate and remember for a long time, but truthfully I don't know if it's one I would re-read. Does that make sense? I have heard a lot of good things about this book but the way it is set up is not really something I like. Thanks for sharing your thoughts on it. You're welcome! I would imagine the format is not for everyone. This one's still on my wishlist, so I need to get to it as soon as I can. I've been hearing about this a lot lately. Awesome! I hope you enjoy it when you get around to it, Athira! I read this one years ago so the details are fuzzy but I remember reading for a book club and it led to lots of discussion. I haven't read any of her other books though and really should! Never read Amy Tan's work, or read short stories! However, I'm planning on changing the latter, because I have a few recommendations of good short story collections. Here goes, I might add this one too! 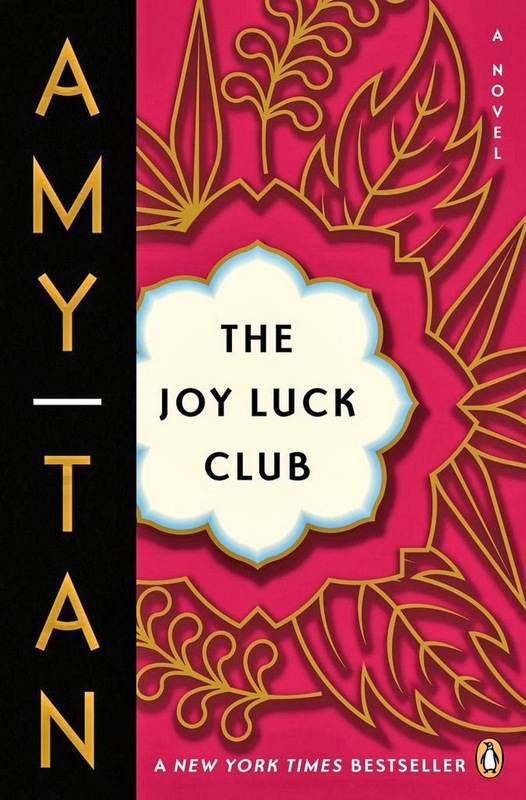 I love the Joy Luck Club! I also liked the Kitchen God's Wife. I didn't even know about Saving Fish From Drowning, so I will have to check that one out! It has been on mine FOREVER, too! I did find it the other day, though. That's a good start, right? One day I may even read it! This is one of my all-time favorite books. I've read it three times so far (I'm due for a re-read, LOL), and I've cried every time. I've enjoyed all of Tan's other novels, though I just got her newest and haven't started it yet.